The trading P&L Zones™ (profit/loss) are graphical displays that show the potential areas and amounts for profit and loss from the entry point of an equity or options position. 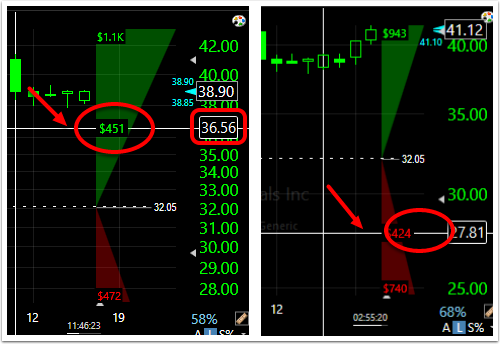 For any trade in either simulated or live trading, the zones are automatically calculated and display the values displayed reflecting the approximate gain/loss at the option's expiration date. Single Legged Long: an order for a single-legged long position shows the potential strike price with a dashed line. The break even point is seen in white with the potential profit (green) shown above and potential loss (red) shown below that level. Single Legged Short: an order for a single-legged short position shows the potential strike price with a dashed line. The break even point is seen in white with the potential profit (green) shown below and potential loss (red) shown above that level. Multi-Legged Long (High Volatility): an order for a multi-legged long, high-volatility position shows the potential strike prices with dashed lines. The break even points are seen in white with the potential profit (green) shown above or below the break even lines and potential loss (red) shown between the break even lines. Multi-Legged Long (Low Volatility): an order for a multi-legged long, low-volatility position shows the potential strike prices with dashed lines. The break even points are seen in white with the potential profit (green) shown between the break even lines and potential loss (red) shown above or below the break even lines. Multi-Legged Short (High Volatility): an order for a multi-legged short, high-volatility position shows the potential strike prices with dashed lines. The break even points are seen in white with the potential profit (green) shown above or below the break even lines and potential loss (red) shown between the break even lines. Single Legged Long: a single-legged long position shows the potential strike price with a dashed line. The break even point is seen in white with the potential profit (green) shown above and potential loss (red) shown below that level. Single Legged Short: a single-legged short position shows the potential strike price with a dashed line. The break even point is seen in white with the potential profit (green) shown below and potential loss (red) shown above that level. Multi-Legged Long (High Volatility): a multi-legged long, high-volatility position shows the potential strike prices with dashed lines. The break even points are seen in white with the potential profit (green) shown above or below the break even lines and potential loss (red) shown between the break even lines. Multi-Legged Long (Low Volatility): a multi-legged long, low-volatility position shows the potential strike prices with dashed lines. The break even points are seen in white with the potential profit (green) shown between the break even lines and potential loss (red) shown above or below the break even lines. Multi-Legged Short (High Volatility): a multi-legged short, high-volatility position shows the potential strike prices with dashed lines. The break even points are seen in white with the potential profit (green) shown above or below the break even lines and potential loss (red) shown between the break even lines. When there is unlimited profit or loss potential, the red/green zones will contine to get larger the farther up or down the chart goes. When the potential profit or loss is limited (e.g. to the premium paid or recieved) the red/green zones will show a capped limit the farther up or down the chart goes. Strike Price: moving the strike price up or down will move the break even point for the order. Expiration date: moving the expiration date nearer or farther will move the break even point for the order. Place the cursor on the chart at any point. Click to activate pointer mode (crosshairs appear). Note the value in the P&L Zone. This would be the amount of profit (or loss) if the position were closed at that price level. 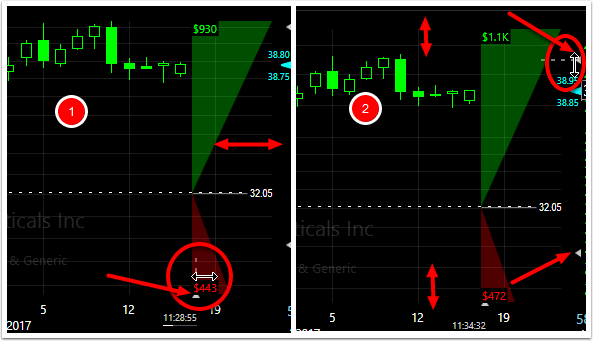 At the end of the chart: positioned just above the date scale near the right end of the chart is a small white arrow. Hover over the arrow, then click and drag left or right the vertical dashed line that appears. At the top/bottom of the chart: positioned just left of the value scale near the top and bottom of the chart are small white arrows. Hover over the arrow, then click and drag up or down the horizontal dashed line that appears. Turn the P&L Zone display on or off by clicking the Trading icon at the lower left of the chart price pane. 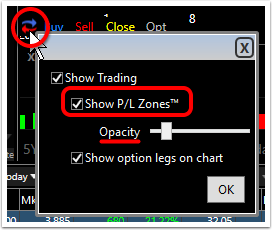 Check or uncheck the tick box next to Show P/L Zones™ as preferred. Use the slider to change the opacity of the P&L Zones (make them lighter or darker on the chart).